Indie rock institution The National originally hails from Cincinnati but eventually settled in Brooklyn and found international fame. At the end of April, they will return home with a bunch of their musician and artist friends for their inaugural Homecoming Festival. 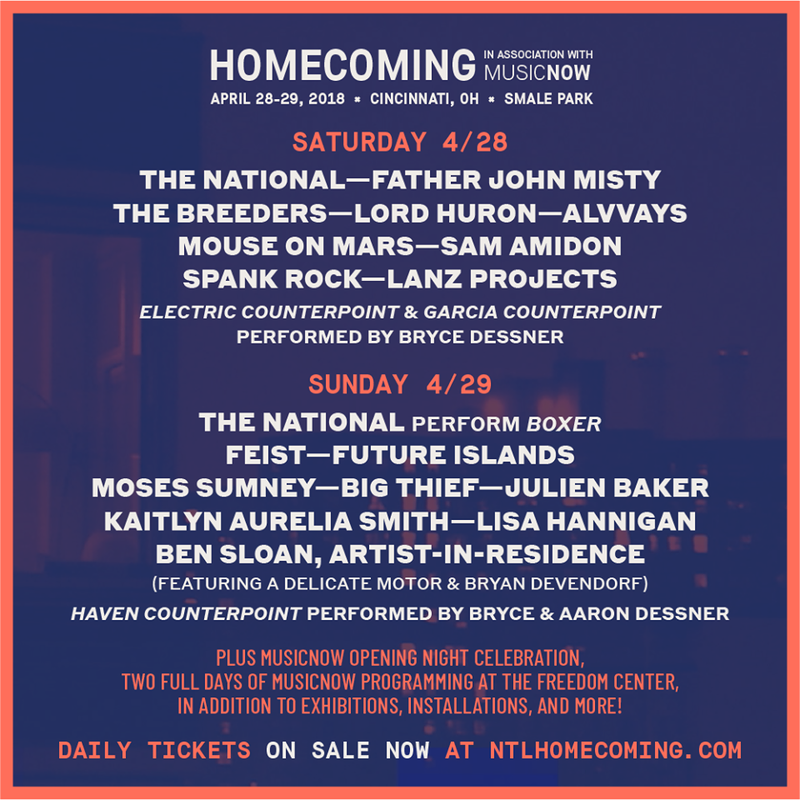 Curated by The National and in association with MusicNOW, the Homecoming Festival will take place at Smale Park in Cincinnati on April 28 and 29. The National will headline each night of the weekend and will perform their acclaimed album, The Boxer in its entirety on Sunday night to close out the show. 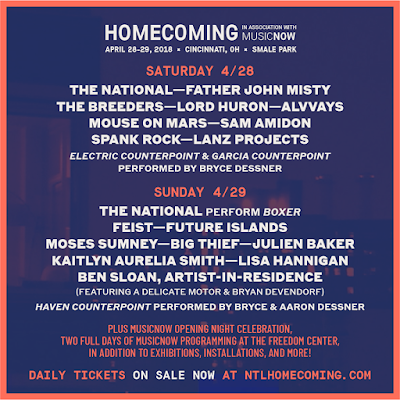 Also appearing are Dayton’s own alt-rock legends The Breeders as well as Feist, Father John Misty, Future Islands, Moses Sumney, Alvvays, Big Thief, Julien Baker and many more. In addition, the Dessner brothers, as part of the 13th installment of their MusicNOW series, have curated several simultaneous classical music and art events including, the Crash Ensemble performing Hans Abrahamsen’s Schnee and members of the Cincinnati Symphony Orchestra performing Andrew Norman’s The Companian Guide To Rome, as well as photography exhibitions and an installation by Icelandic multimedia artist Ragnar Kjartansson. Stay tuned for more coverage and interviews later this month!